About 130 pieces were contributed by 22 artists and showed images that included bucolic scenery, holy places and the animal kingdom. The event was arranged by the parish’s “green team,” eight local residents who are taking to heart Pope Francis’ directive that asks Catholics each year, from Sept. 1 to Oct. 4, to think about and show their interest in planet Earth. That letter came a few months after the pope had issued his encyclical, “Laudato Si’” which called for a greater concern for the environment. The influence of “Laudato Si’” was a major factor for “green team” members in crafting the art show. “We want people to respect creation, to be aware of God’s part of creation,” team member Barbara O’Keefe said about the artwork on display. 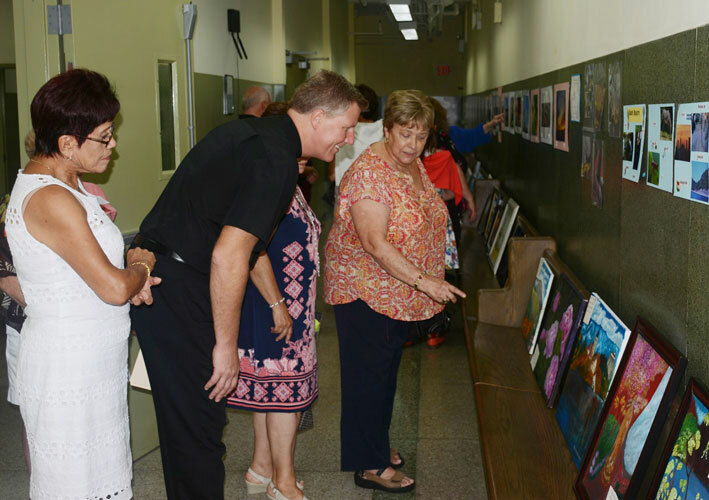 As parishioners filtered downstairs from the main church on a hot Sunday morning, artists and onlookers mingled to review the items on display. Paul Franzetti is the parish’s resident artist. His paintings portray landscapes, animals and scenes from his travels around the world. Many have been incorporated into calendars for the last 10 years that he’s sold to support Damien House, a hospital in Ecuador that cares for persons with Hansen’s Disease, commonly known as leprosy. “This is nature as God created it and as the artist sees it,” Franzetti said in describing how illustrators and sculptors display moments in time. Vincenza Russo, of St. Luke’s parish in Whitestone, was invited to display her artwork by fellow artist and Blessed Sacrament parishioner Maria Santalese. Though Russo wasn’t aware of the theme of the show, she said she felt glad that her oils on canvas, like a scene of Italy or the peonies from her garden, conveyed a solitude and serenity that was much needed in today’s world. The show was by and large glimpses of everyday life and that’s exactly what brother and sister Deirdre and Rich McDonough, long time parish residents, portrayed in photographs like one of a moonlit sky or of clouds over Long Island’s Great South Bay. “It’s a privilege that God gave me the chance to witness all this,” her brother Rich said about the scenes he captures in his photos. Parishioner Debbie Stengle came down to look at the art with her daughter Ava. She marveled at how the McDonough siblings appreciated nature and what God creates.